Are you bored with writing your garden blog, or need a change of pace? As someone who writes in the "how-to" voice for my garden blog, sometimes, crafting a post can feel rather daunting. Then there's also the creative slump you fall into. I find it hard to write outside the how-to voice after all these years of trying to keep post short, simple and to the point. A couple of my favorite non-gardening blogs put out writing prompts and I've always wanted to join, but all of my issues keep me from participating. 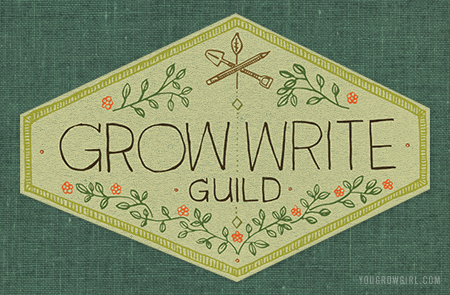 But now Gayla at You Grow Girl has created an online garden writing club of sorts that I may not be able to resist. "I want to write more stories. And while I am doing it, there are so many more still that I want to tell. So I started to take down ideas to help me dig in further. In doing so, I imagined that some of you out there are like me and could also benefit from some prompts and a little encouragement. And that’s where the idea for the Grow Write Guild came from. Every two weeks I will post a writing prompt. Some will be really simple and others will encourage a longer response. Some will be just one sentence, while others will include further hints to get you thinking about different ways that you can approach the topic. You can choose to follow along and write a response that is made public on your own blog or kept completely private. Should you choose to make it public, come back to this site and share it in the comments by posting a link to the work. Even if you don’t make it public, I’d love it if you came back to share how the prompt worked out for you." Sounds interesting? Visit the post for the Grow Write Guild announcement for the full details. On an unrelated note, Davin Risk, Gayla’s creative partner, created the graphic above. Take a moment to study it and take it in and see just how perfect it is. I've long been a fan of his work with Gayla, but he's been really been killing it in the graphics department lately. See also the graphic he created for You Grow Girl's blogging birthday. It sounds very interesting, thanks for sharing! I'm definitely going to check it out.